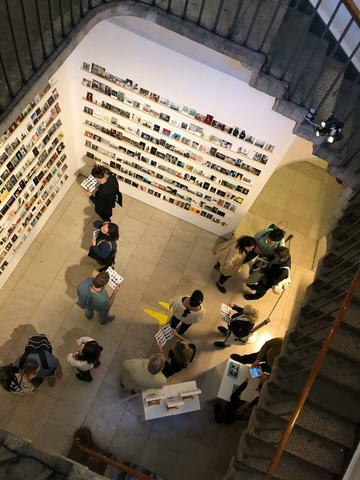 On the weekend of the 17th to 20th of May, Somerset House opened it's doors to Photo London- a world-class photography fair and as a catalyst for London’s dynamic photography community. With a huge photography tent in the centre of the court yard, and every room taken over by the world's best photography, the fair is the extravaganza it sets out to be. We were tucked away in a wonderful corner at the bottom of the Stamp Staircase in the South Wing. A cool, quite sanctuary for fair-goers to find at the end of their tour. Fair-goers were charmed by the images and the display. It really worked when people had been round the fair and ended up with us, as the fair itself was so well reflected in the collection. It also democratised the art world within the confines of Photo London, most fair-goers can only window shop and yearn, but Photography on a Postcard meant that anyone could go home with a one off print. For those of you who didn't get to see them, both Genesis and A.Bliss did such a marvellous job with the printing and the mounting. The finished results were really special little objects that you wanted to keep. We sold the large majority of the cards with the remaining images going online for 2 days after the fair and selling like hotcakes. This was exciting for those who live internationally and could not make it to Photo London but who were desperate to get their hands on a signed, edition of 1 steal. The really exciting news is that it looks like the UK will be the first country to eliminate hepatitis C which is down to The Hepatitis C Trust's lobbying. All of the artists, and our supporters have all helped that happen by donating and purchasing the cards. To close Photo London we held a party at Somerset House's iconic Spring Restaurant. With a performance from Lock, speeches and an art auction, the guests had a wonderful time in the restaurants ballroom. Artists and celebrities such as Carl Barat, Sadie Frost and Andy Leek were all in attendance. It was the perfect way to close a brilliant weekend! We want to say a huge thank you to the organisers, artists and supporters from all of us at Art on a Postcard and The Hepatitis C Trust and please make sure you all signed up to our newsletter here so that you keep up with our activities and get all the exclusive news.